The Norwegian Getaway cruise ship sails northern Europe and the Baltic in the summer and to the Caribbean from Miami in the winter. Many of her interior common areas have a bright and airy look, much like you might expect from a Florida theme. The stairwells are a bright fuchsia, and the ship has many splashes of turquoise, blues, reds, and yellows. Other articles cover The Haven, cabins, lounges and bars, outdoor deck areas, and dining venues on the Norwegian Getaway. Let's take a look at some of the other interiors. As seen in the photo on the previous page, 678 Ocean Place is the entertainment hub of the Norwegian Getaway cruise ship. 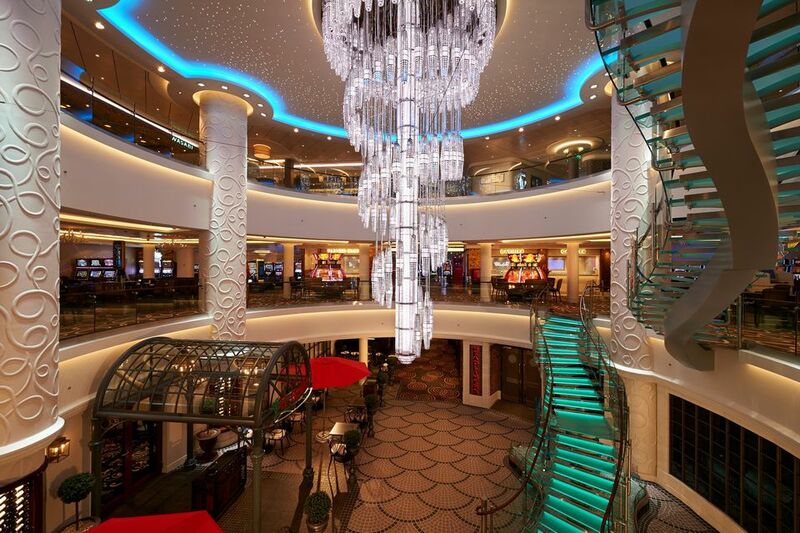 Spanning three decks, the area is dominated by this gigantic chandelier. 678 Ocean Place is lined with bars, lounges, dining venues, and retail shops, with each level offering something a little different. The Atrium is on deck 6 of the Norwegian Getaway cruise ship and features the large video screen seen in the photo above. The Atrium Cafe, Bar, guest services desk, shore excursions desk, and Internet cafe surround the wide open Atrium space. The Mandara Spa on the Norwegian Getaway cruise ship offers more than 50-day spa treatments, including hot-stone massages, oxygen facials, acupuncture and age-defying options. The combined spa and fitness center span decks 14 and 15 forward and covers 23,000 square feet. Flywheel® is the latest in indoor spinning, with stadium cycling classes all over the USA. The ride includes climbs and descents, and participants work their arms with weighted bars at the same time. The classes are challenging, but fun. The Salt Room has its roots in the therapeutic salt caves of eastern Europe. The Salt Room on the Norwegian Getaway cruise ship is similar to the one on her sister ship the Norwegian Breakaway. Many believe that salt room therapy helps alleviate respiratory and skin ailments, strengthen the immune system and promote better sleep. If it works as ​advertised, I think many of us could use a visit! The Thermal Suite in the Mandara Spa on the Norwegian Getaway is filled with places to relax and rejuvenate. It features a steam room, dry sauna, Vitality pool, hot tubs, waterfalls and heated tile loungers. Those staying in the spa cabins and suites have complimentary access to the Thermal Suite during regular Mandara Spa opening hours. The Vitality Pool in the Thermal Suite will relax tired muscles and relieve stress. This hydro pool is a great addition to the spa. The steam room in the Thermal Suite is another relaxing feature in the Mandara Spa of the Norwegian Getaway cruise ship. The fitness center in the Norwegian Getaway cruise ship Mandara Spa features all the latest cardio, weight, and resistance exercise equipment. It also has great views of the sea--something you can't have at your fitness center back home. The Norwegian Getaway has one of the largest casinos at sea, and guests can play favorites like Blackjack, Craps, Roulette, Texas Hold 'Em and Poker on the 26 game tables in the 18,000-square-foot space. Of course, the casino also has over 300 slot machines, and guests can get a quick drink at the cozy Bar 21. Many cruise travelers love to have their pictures taken by the ship's photographer, and the Norwegian Getaway cruise ship uses this photo gallery on deck 8 to display the pictures. The large Getaway Theater is on decks 6 and 7 forward. This large showroom has comfortable seating and great views from every seat since it doesn't have pillars blocking the sight lines. The big draw to the Norwegian Getaway Theater is "Legally Blonde", a 7-time Tony® Award-nominated musical based on the movie of the same name. The Tides Boutique and Tradewinds Tax-and Duty-Free shops are on deck 8 midship in the 678 Ocean Place hub. Many large mainstream ships have tiny libraries, but this one on the Norwegian Getaway is quite nice. It's found next to the card room and meeting rooms near the Atrium on deck 6. Kids love video games at home and at sea, and this video arcade next to the Entourage Teen Club on deck 16 is a busy place. Splash Academy is the kids' club for ages 3-12. Located on decks 12 and 13 midship, the club features a light-up dance floor, circus school, Wii and PlayStation 3, and cinema. In addition, kids can do crafts and participate in pirate parades and other fun group activities. The Norwegian Getaway also has a dedicated nursery on deck 16 for babies ages 6 months to 2 years. The Entourage teen club is on deck 16 aft and is open to ages 13-17. This club looks much like an adult lounge, but without the adults.